This adapter allows you to attach 2" eyepieces and accessories to any equipment/adapter that has a male T thread (T2 mount). Common examples are telephoto lenses (which can be converted into excellent finder telescope with the use of this adapter, spacers, and an eyepiece), T thread adapters, off axis guiders, etc. Some Maksutov-Cassegrain telescopes use a male t-thread on their rear cell, so you can use this adapter as a 2" visual back for such scopes. This high quality adapter has a standard T2 (m42x0.75) female thread on one end and a 2" eyepiece barrel on the other end. 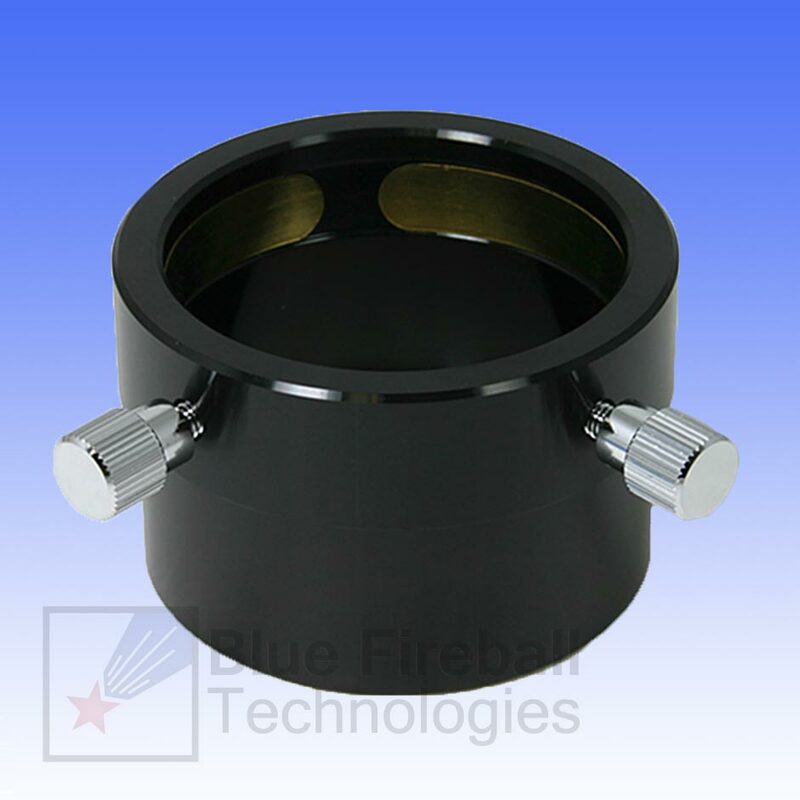 Eyepiece barrel features brass compression ring. Made of black anodized aluminum. Total length = 40mm. Inside depth of eyepiece holder = 35mm. Made in Taiwan. 4.8 (Based on 13 Reviews) 100% of reviewers recommended this product. I needed this to add a coma corrector to a telescope that had a proprietary connection with a proprietary t adapter, but no 2 inch adapter and it worked perfect. The two inch cup could be a little deeper. Some eyepieces don't seat to their shoulder. Probably still fine but I'd like to see full penetration of the eyepiece. Review by rickfieldrj of Nottingham, England. Shipping time and costs are very good for import to U.K. and Agena's dispatch times are remarkably quick - a very professional operation and highly recommended! An excellent adapter to fit 2" Tele Vue Power Mates to the Lunt blocking filter. Compact and rigid. Well made. Review by Don of Vancouver, BC. I use it with a Lunt LS60 THa solar telescope. It allows me to attach a 2" 2x PowerMate to magnify solar images. Review by Terri in Vermont of Williston, VT. I use the product with an SCT to attach photographic accessories. As most Agena products, it's well made and a good value for the money. Review by Powerstar8 of Queretaro, Mexico. Perfect fit and finish. I added the eyepiece holder to use 2" accesories on my Lunt BF1200. Just screw it and work. Review by PBurkPiper of Loveland, CO. I purchased this as an adapter for my off-axis autoguide accessory and it functions beautifully. Review by RPM_BR of Sao Paulo, Brazil. I bought it to use with my Astro-tech field flattener (male m42), so I could put a 2" diagonal after that (and a bino). I regret it a bit, I would rather have bought the #C-01, with two thumbscrews instead of one, for only 3 dollars more, If I knew Agena had it for sale. But it was my mistake, I have to eat it up. Review by MicroAstro of Canada. I bought this to replace the 1.25" EP holder attached to the blocking filter/diagonal on my Lunt 60 solar scope. Works perfectly. Allows me to use my 2" zoom EP with my solar scope and maintains compatibility with the 2" focuser on my astro scope. Review by Paul of Stratford, CT. I am using this in combination with a Baader Vixen M43 Female to T2 Male Adapter (#T2-22 1508037). I removed the original 1.25" visual back and diagonal from the refractor. I replaced the visual back with the M43/T2 adapter. The T2/Eyepiece holder threads on the the M43/T2 adapter. This accessory holds my 2" eyepieces firmly. The 21mm, 13mm, and 8mm show no vignetting. Only my 35mm Kellner shows some minor vignetting at the edge of field. Review by Woody of San Diego, CA. This is a beautifully machined heavy-duty adapter with two setscrews and a brass compression ring. Review by Mike of Fort Collins.